I received this book for free from a blogger in exchange for an honest review. This does not affect my opinion of the book or the content of my review. 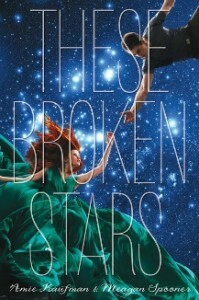 These Broken Stars was an epic tale of survival and romance. It was described as “Titanic in Space.” Disney Hyperion called it “A little bit Titanic, a little bit Lost, a little bit Battlestar Galactica.” And though I haven’t watched much of Lost or BG, I can definitely tell you – from what I do know – that those descriptions are all perfect and right on the money. I loved Lilac and Tarver. Lilac definitely had her bratty moments, but she had such an amazing story-arc and she grew, matured and changed so much, you couldn’t help but like her. It got to a point where I just rolled my eyes and let it roll off my back – Being bratty was just her defense mechanism. I’d love to say she outgrew it, but she never really does, though – again – she matures a lot. Tarver is almost always in survival mode. He is the practical one and sometimes that got frustrating, especially when he didn’t believe Lilac during certain scenes when certain things happened. I mean, it was realistic but very, very frustrating! I really appreciated the fact that this didn’t feel like insta-love or “love at first sight.” They’re relationship had a slow build-up to it. They needed each other to survive, which forced them together more quickly than they would have liked (in my opinion), but they still didn’t fall madly in love for some time. I loved the banter between them. There were definitely some laugh-out-loud moments. And then, about 35% into the book, there’s this moment between them and you can absolutely feel the shift in their relationship. Yep. I was just… mind-blown! Throughout the book, we hear from Lilac about how controlling and manipulative her father is. Near the middle/end, we REALLY see just how.. evil (for lack of a better word) he is. But, one of my favorite parts of this book? Lilac stood up to him and gave him a piece of her mind. Loved it! I had a few minor issues with this book, which is why it got a 4 instead of a 5. I won’t go into those reasons in this review, just because they were really minor and might have just been me and my state of mind. But overall, I loved it and found it to be original and enjoyable. I can’t wait for book two in this epic trilogy. I had similar feelings about this book! I really enjoyed it but I definitely did have some small problems with it – Lilac’s brattiness being one of those haha :) Great review though! Lilac was definitely a hard character to like in the beginning! But she matured a lot. Have you read This Shattered World?